Note: You also get a free queso meal and brownie sundae on your birthday..
Great alternative to coupons, score up to 20% off vouchers and gift cards for On The Border Mexican Grill Restaurants. Visit On The Border Restaurants and get their fresh handmade guacamole for only $2.50. Today only for national margarita day. Print the whole page. Get a free bowl of original queso with an adult entree purchase. 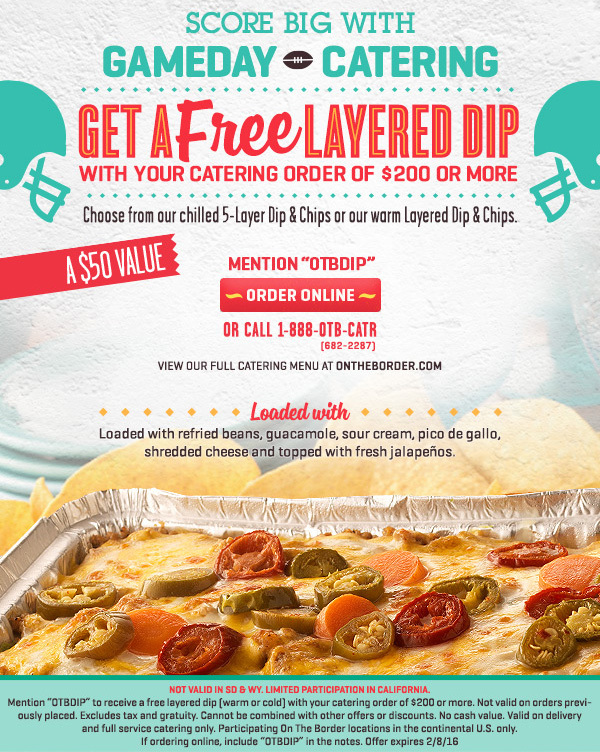 Get a free layered dip with catering orders over $200. Print coupon and receive one original queso & guacamole duo for only $1 when you purchase an adult entree at regular price. Valid at participating locations only. Must present coupon at time of purchase. On The Border: Print coupon and receive a free appetizer or dessert with the purchase of an adult entree at regular price. Valid at participating locations only. Must present coupon when ordering. Print coupon and enjoy a $10 discount on any dine-in order of $40 or more. Valid at On The Border restaurants in Roseville, Natomas, Elk Grove, Dublin & Milpitas only. Print coupon for a 20% discount on party platters at participating locations. Take out only. Must present coupon when ordering. On The Border Mexican Grill & Cantina is the place to go for fresh Border-style food. 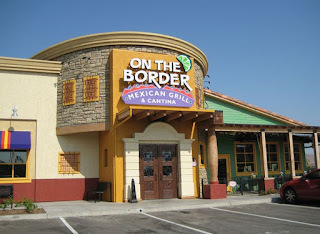 On the Border serves tableside guacamole, tortilla chips, margaritas, and of course, delicious tacos and burritos. Come get a taste of the Border and save money with our printable coupons.